One of the great advantages of photography is that you become aware of things that surrounds you but you never paid attention to before. I often passed by these bushes by car but I never came closer to see what they are, until now. 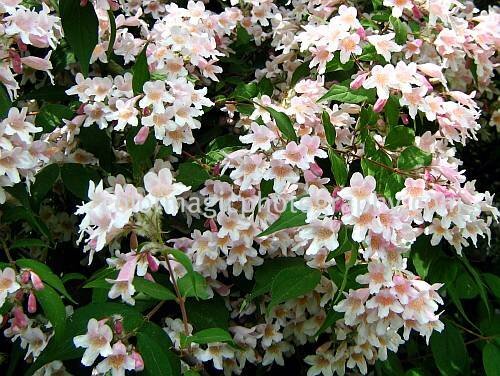 This is the beauty bush, Linnaea amabilis, earlier known as Kolkwitzia amabilis and it really deserves its name. This spreading shrub, with gracefully arching branches, blooms in late spring with light pink bell-shaped flowers. 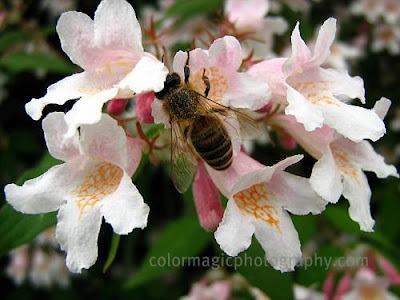 This shrub is usually as wide as tall and needs plenty of room to develop its long, arching branches. Not a good idea for a small gardens but if you have the necessary space for it, this bush is a real garden delight. 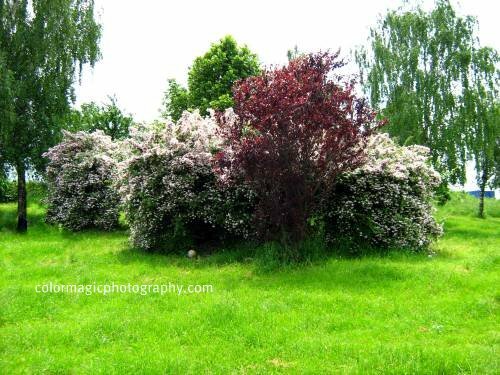 These shrubs in the photos are growing wild and they love it, though they are very rare and threatened in the wild. They don't need any care and don't like to be pruned. Bees and birds love these flowers too. In autumn, once again the shrub lives up to its name, developing intense purple or white berries on their branches, another color spectacle of nature. I can't wait to take some photos of those beautyberries too. Visit and join Macro Flowers Saturday for beautiful macro flowers. As I'm always looking for photo ops, I took my camera and went out to the river banks. There is always something going on out there in summer. 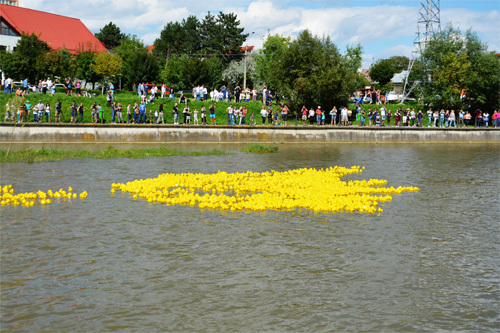 I was right, I just found a rubber duck race organized for fundraising. I'm sure everybody knows those cute, yellow, toy duck that can be adopted (sponsored) for charity fundraising challenges and events. People adopt (sponsor) a duck and they get a numbered ticket for the derby duck race. At this event here, 2000 ducklings were placed in a dragnet anchored on this blue pedestrian bridge over the Somesul-Mic river. After dumping them into the river, they were left to float about 700 m downstream. 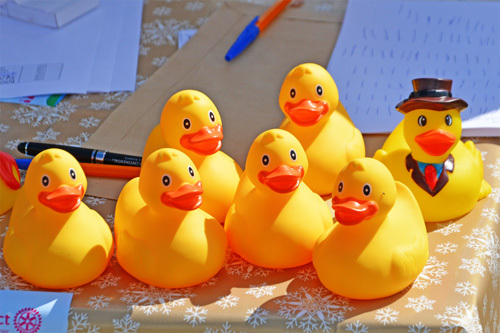 Ducklings that reach the finish line first win a prize for their sponsors. 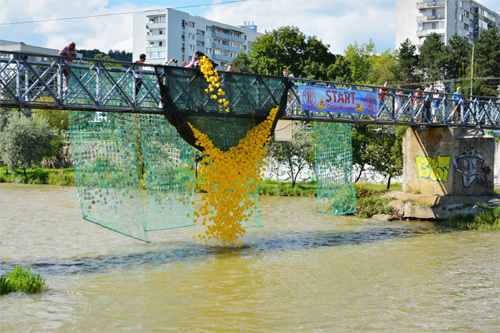 All profits resulting from this duck race will be donated to a local Children's Home (so they say). "We are a nonprofit organization, an alternative to state care system that provides a home for 10 children in this system. We provide a family environment for both girls and for boys , cultivating the idea of responsibility and family. We focus on education, in all its forms : the school , the arts and sport, through various experiences such as visits , camps, etc." Though people out there knew that the fundraising is for a children's home, not many knew that all the agitation was for a children's home with just 10 children. And then, some people wonder why do we love to hate nonprofits? 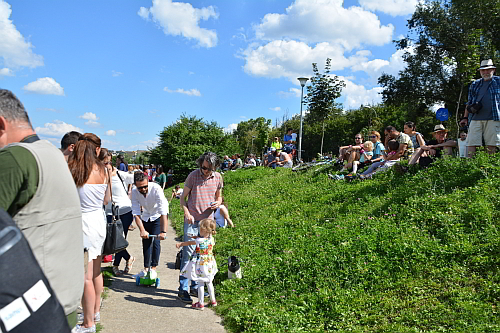 All in all, it was nice outdoor fun, children, parents, young and old, all enjoyed the duck race. 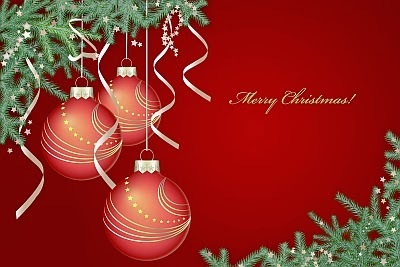 Wishing you peace, joy and wonderful memories during this joyous season. May all your wishes and dreams come true and may you feel this happiness all year round. It is a time when we say a quiet thanks for all that we have and for all that the future holds. And is a time for remembering with love and appreciation the people in our lives who make a difference. 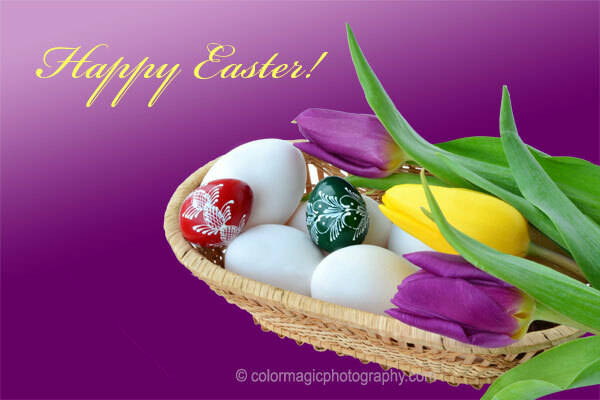 May your Easter be special ! Dye Easter eggs-white or brown eggs, what works best? Each year, at Easter time, I am looking for white eggs to buy for dyeing eggs. I haven't seen white shelled eggs for quite some time, they are not preferred by commercial producers, for some reason. Surprisingly, this year, grocery and supermarket shelves are loaded with white shelled eggs at our expense, of course. Like everything else holidays relate, white eggs are much more expensive than brown eggs. I don't like unpleasant surprises, so I bought a dozen of white eggs and made an egg dyeing test. I share bellow my experience and results obtained with different dyes. As with all things there is a positive and a negative aspect when dyeing either white and brown eggshell. When using commercial or food coloring dyes, eggs with white shell will display pure, vivid colors. Natural dyes obtained from vegetables and herbal teas will display on white eggs light, natural, pastel colors, if this is what you are after. Though, dyeing eggs with natural dyes takes much longer to obtain the color you wish, it is a great craft activity for kids and family. Beautiful colors are obtained from onion skins, red cabbage, beetroot, spinach leaves, marigolds, dandelions, cornflowers, raspberries and many other plants. Children have great fun using natural dyes from plants and vegetables that they are familiar with in their everyday life. Opposed to the logical believe that white eggs are more suitable for dying, this is not true with onion skins, unless you prefer a very light, undefined color. The white eggs I just dyed with onion skin have a muddy, muted color. I like a deeper, brighter color for my Easter eggs, so I'll stick with the brown ones. Check out the brown ones dyed with onion skin and see the difference. You will also notice that the leaf pattern on the brown eggs has a warmer, yellowish tone with a more pleasant contrast than these here. Dyed eggs are usually not evenly coated mostly because of the tiny rugosities in the egg shell texture. You may not see it in the photo but all these little color patches are more prominent on the white shell. Another disadvantage of using white eggs is that their shell is much thinner. You will end up with many cracked eggs, no matter how patient or careful you are when boiling them. This is not such a great problem when using natural dyes, though it is unaesthetic. Brown eggs have tougher/thicker shells, at least the ones I can buy here from factory-farm hens. This could be different in case you have the possibility to raise your own chickens but I'm not so sure. Leave a comment and share your experience with dyeing white and brown eggs.